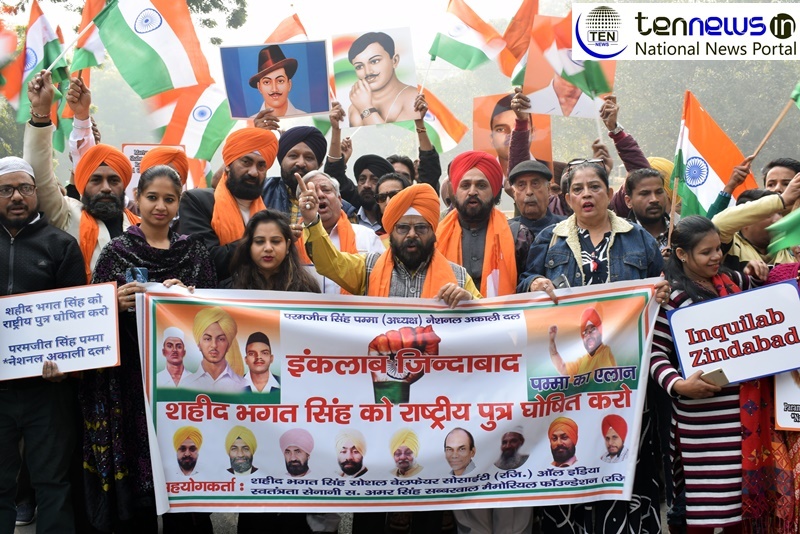 New Delhi: Paramjeet Singh Pamma, President of National Akali Dal joined by hundreds of people holds a strong protest in New Delhi, demanding martyrdom Status for the freedom fighters like Bhagat Singh, Chandrashekhar Azaad, Rajguru, Sukhdev and others. The massive protest was joined by people from the communities like artists, social-activists, women and children supported and participated in the march, waving the National Flag and posters re-instating the demand for Martyrdom status to Freedom Fighters. Well-renowned Punjabi Pop singer Ashu Punjabi, International star Pankaj Jaswani and RJ Kaur added to the mood by singing patriotic melodies and songs. Protesters also demanded that the government should present “Son of the Nation” status to Shaheed Bhagat Singh.